Review: A young woman and her son struggle to adjust to life after having been confined to a small shed for several years. Based on a novel by Emma Donoghue. At first I was a bit worried about this. I have heard so much about it but still nothing prepared me for what it was really about and what the outcome would be. It is nothing like you imagine it to be. It is about a mother and son relationship and vice versa. The mum is doing everything for her son and even makes the garden shed homely. 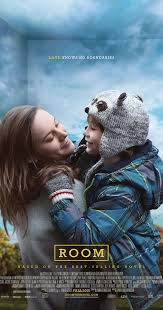 This is fantastically directed by Lenny Abrahamson and has handled the subject matter so sensitively. Both Brie Larson and Jacob Tremblay are fantastic. For Brie Larson to prepare for this role she isolated herself in her home for a month without a phone or internet and followed a strict diet in order to sense what they were going through. One thing I love about this is that you see everything from the little boy’s point of view all the way through this film. When he gets into the big house and is given all the toys you watch him just sitting there not knowing what to do with them all. You also see that the bond between him and his mother drift slightly apart from each other. They are still close but not as close. In the shed they did everything together and had nothing else to distract them from each other. At the start the mum was being cruel to her son and making him unwell. She had to do that otherwise he would never have gone out into the real world or seen any light. If she had also left the boy to do it a year later he probably wouldn’t be interested and would have been a lot harder for his mum. She had to do it there and then otherwise the opportunity would had gone. She also couldn’t have done it when he was any younger as he would have been too little to fully understand. She has done all this just for her own son. The musical score in this is brilliant and works really well within the film. I was just mesmerised about this and totally convinced by it all. It is a film that I could quite happily sit down and watch again and still enjoy. At the Academy Awards in 2016 this won 1 Oscar and that was for Best Performance by an Actress in a Leading Role (Brie Larson). At the Golden Globe Awards in 2016 Brie Larson also won for Best Performance by an Actress in a Motion Picture – Drama. At the Bafta Awards in 2016 Brie Larson won again for Best Leading Actress.